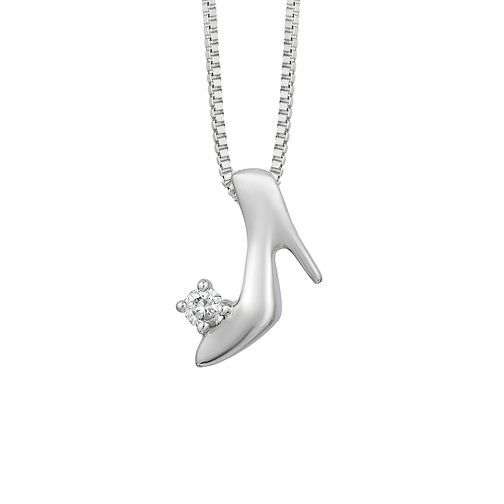 With fairytale detail, this charming diamond shoe pendant from the Enchanted Disney Fine Jewelry collection inspired by Cinderella is the perfect fit for your princess. Crafted in sterling silver, this shimmering diamond encrusted shoe showcases a glistening slipper. Enchanted Disney Fine Jewelry Diamond Cinderella Pendant is rated 5.0 out of 5 by 2. Rated 5 out of 5 by Anonymous from Beautiful collection of Jewelry Wife was very pleased to receive this as a gift. Would definitely be purchasing the collection.